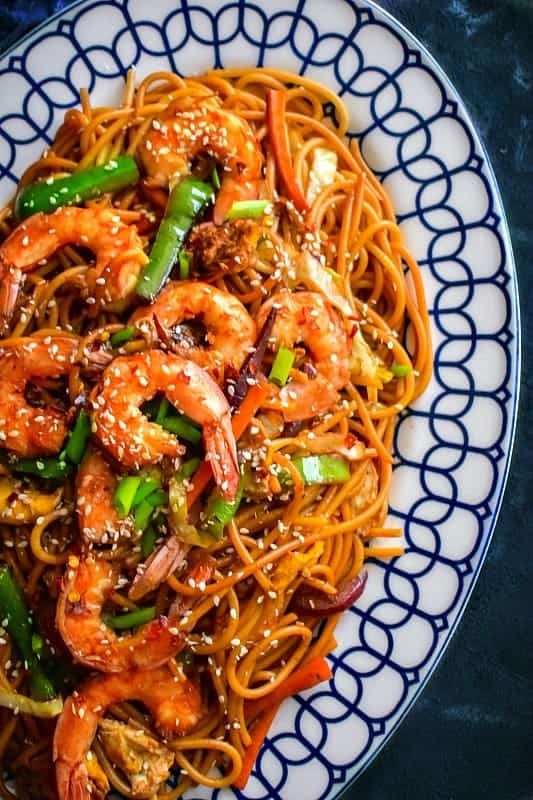 Restaurant Style Shrimp Chow Mein Recipe: quick authentic Chinese Shrimp Chow Mein recipe using shrimp, egg noodles, veggies, and sauce. 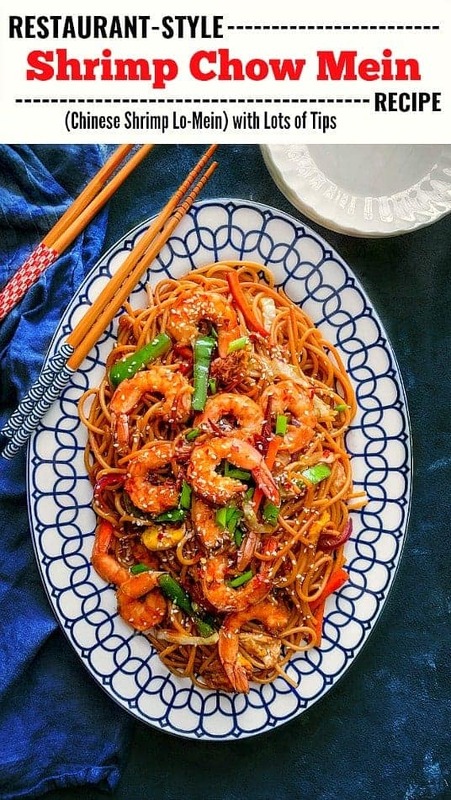 7 easy ingredient swaps + tips to make this shrimp chow mein recipe easily at home. 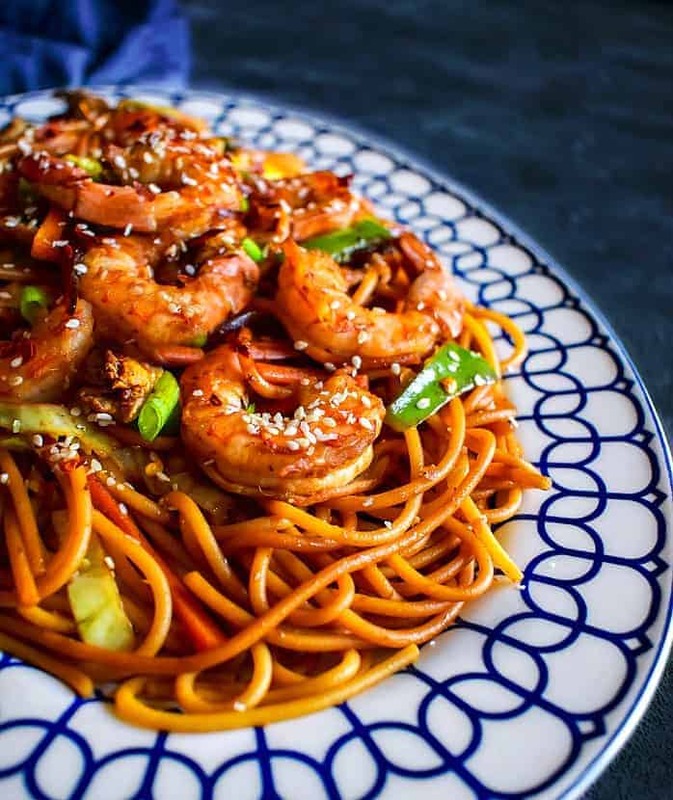 It’s also known as Shrimp Lo Mein and perfect to make for Chinese New Year. 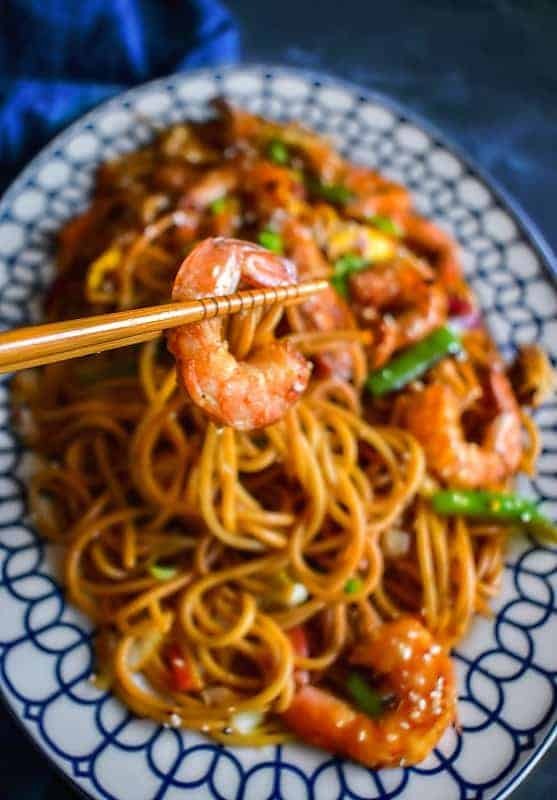 This Restaurant Style Shrimp Chow Mein Recipe will make you forget takeaways from your favorite local Chinese restaurant as it’s soooooo Yummmm! 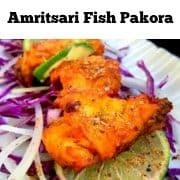 Super easy and made using fresh colorful veggies, it’s a perfect meal to share any time of the day. 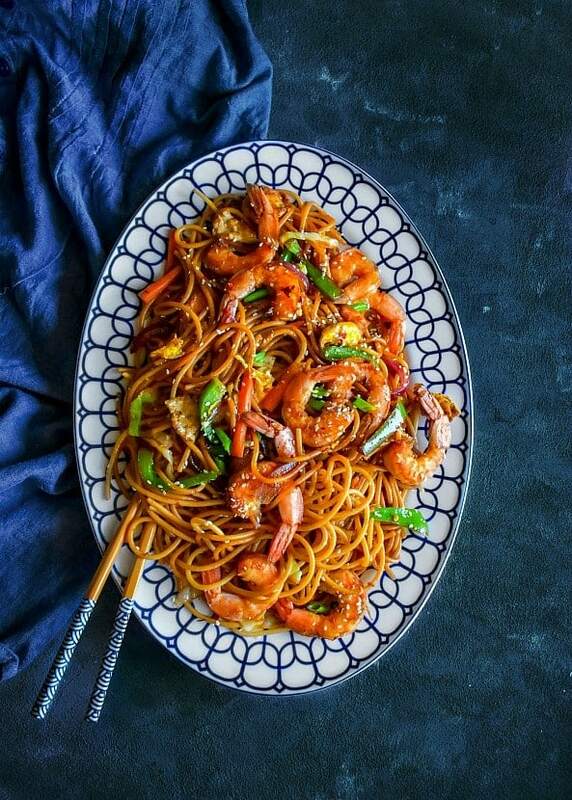 You name it and we have made this Chinese style shrimp chow mein recipe as many times. 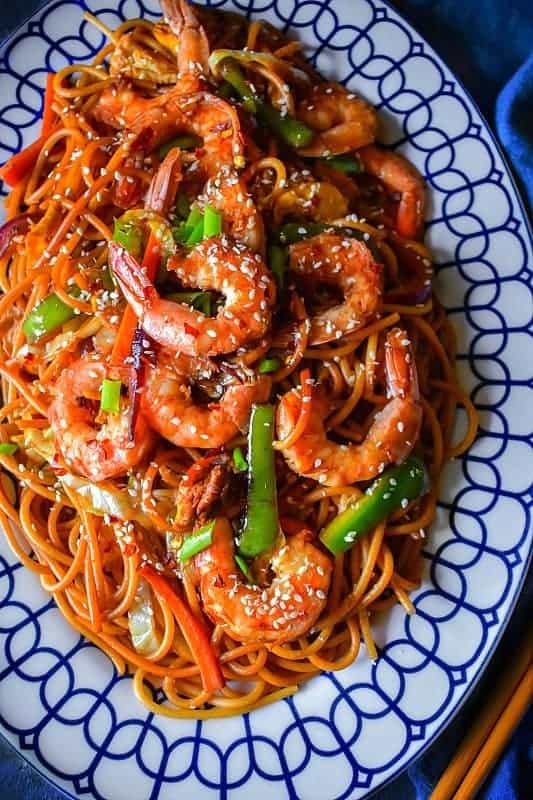 Now, I’m calling it a restaurant-style or restaurant shrimp chow mein recipe as it seriously taste soooooo good and you’d be surprised how light it can be made at home. Also, did you know that eating ‘Noodles/ Chow Mein / Lo Mein’ is considered super lucky on Chinese New Year? It Noodles signifies longevity, hence it’s a MUST to have on Chinese New Year. 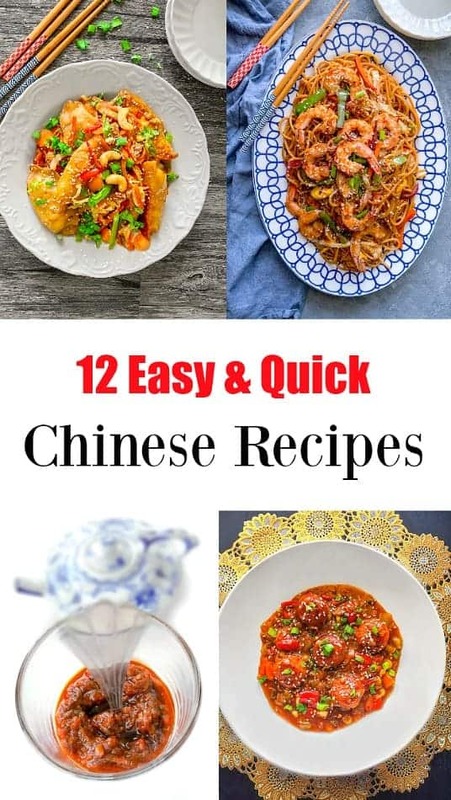 the authentic Chinese recipe calls for Chinese egg noodles or long noodles (as they are popularly called), but, you can use any long noodles (boxed or even spaghetti goes well too). 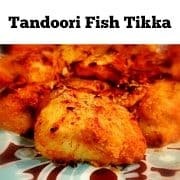 I’d recommend using fresh (cleaned, head-off and deveined) shrimp, but you can even use frozen uncooked shrimps or even cooked frozen shrimps too. This is my favorite kind of soy sauce to use as it’s richer in flavor and gives a nice dark coating to the recipes. It’s slightly sweet and much thicker than the regular/light soy sauce that’s available. But, you can use light/regular soy sauce too and add a pinch of sugar to the ingredients for that rich luscious color+taste. Used for instant flavoring in Chinese / Asian dishes and gives you that nice glaze on recipes. You can use ‘Mirin / Light Soy Sauce with sugar’ or simply skip this ingredient. This is used in most Chinese cooking and especially ‘Stir-Fry’s recipes’ as the oil has a high smoking point. Hence it heats up quick and doesn’t burn easily. 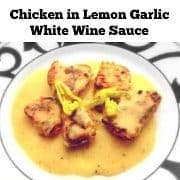 You can use ‘olive oil/grapeseed oil’ instead of this. It’s best used in stir-fry dishes, chow mein/lo mein especially as it’s thin metal utensil that quickly heats up and evenly distributes the heat. You have to be careful cooking with it as it may burn the food easily (it heats up REAL Quick). So you can use a deep pan/pot for cooking similar recipes. 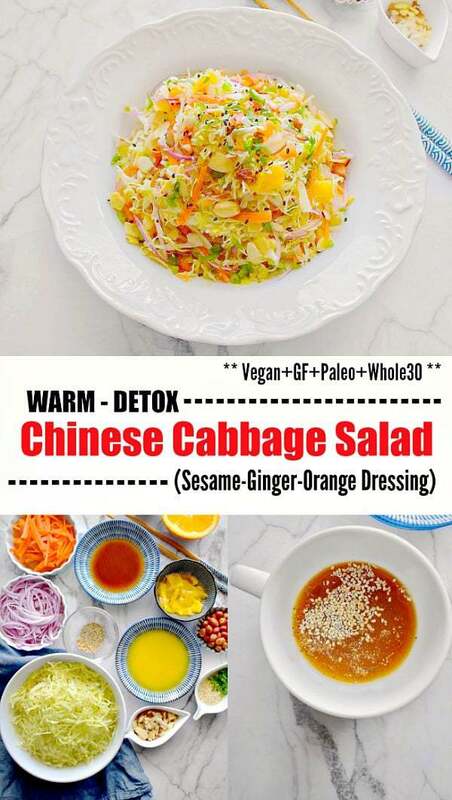 Have you ever noticed that most of the Chinese/Asian recipes veggies are cut in a similar style? They are either all thickly cut or thinly cut but you’d never find a recipe where you see a mix of both …hm, right! 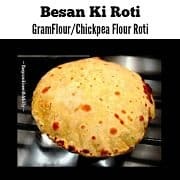 That’s because, most of these dishes are cooked quickly, hence if the vegetables (or even meat) are all cut in similar size/proportion, it cooks evenly and quickly. It’s especially true for Chow Mein and Fried Rice. 1– Do you get stressed making noodles for chow mein as they clump or don’t stay fresh? Here’s a Great Tip to Keep: Add a tsp of oil in the noodles once they are cooked and strained. You need to mix the oil with the noodles, this way they don’t clump together and stay fresh for longer. 2– You can store this oiled noodles in an air-tight box in the fridge for upto 3 days. Simply wash them with hot water and they become fresh to use again. 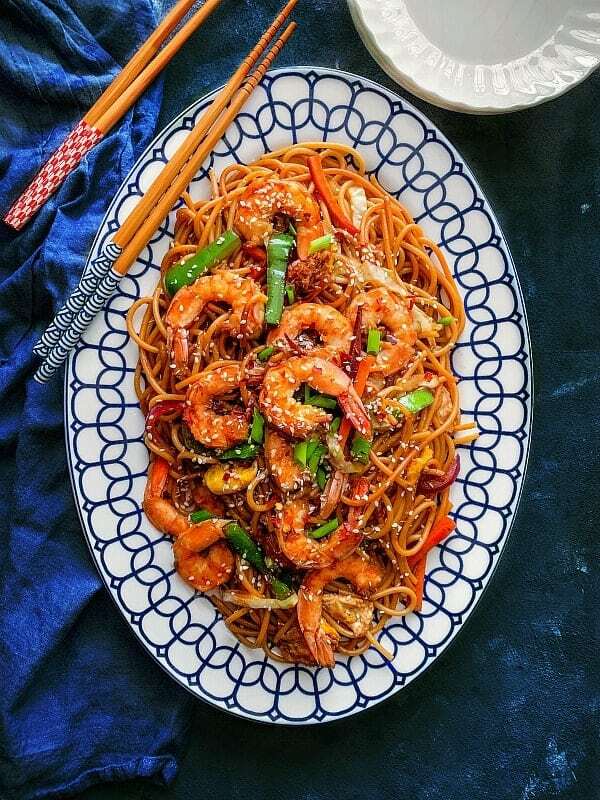 quick authentic Chinese Shrimp Chow Mein recipe using shrimp, egg noodles, veggies, and sauce. Also, lots of variation and tricks given below. In a bowl, add all the sauce ingredients and whisk. Make the Egg Noodles (any noodles you are using) as per instructions and keep aside. Heat a wok or large/deep pan and add 1Tbsp sesame oil. Add the whisked eggs and cook them for a minute. Turn them and make a light scramble. Remove from pan. Add the remaining sesame oil. Add chopped onion, carrots and saute for 1/2 minute (medium heat). Add chopped bell pepper, cabbage, scallions and saute for another minute (medium heat). Add the shrimp and the sauce. Mix and saute everything on high flame for a minute. Now add the noodles and mix everything. Saute on high heat for 1-2 minutes and turn off the flames. 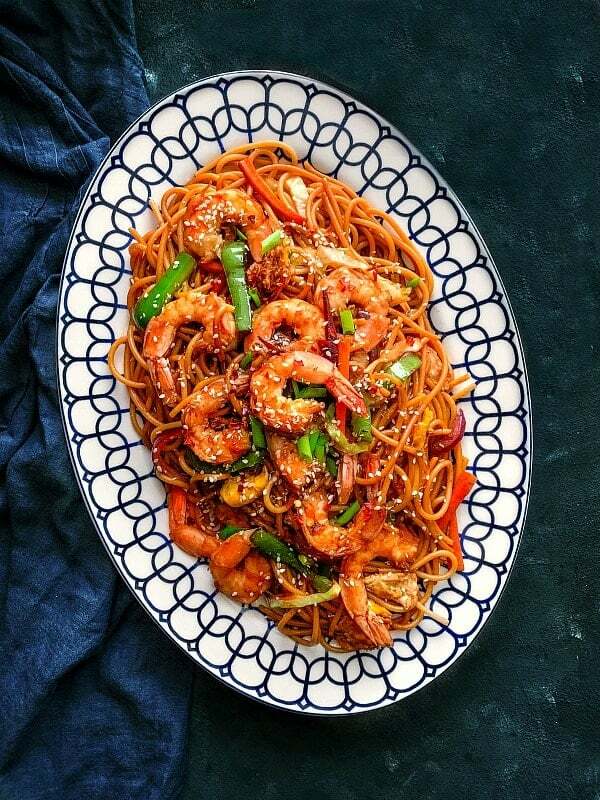 Transfer the Shrimp Chow Mein to a serving plate/dish. Sprinkle sesame seed and fresh scallion. * 1 Packet Egg Noodles is about 4.Oz. 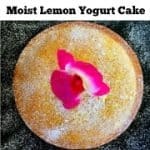 you can use any long noodles too. ** You can use Frozen / Cooked Shrimp too. 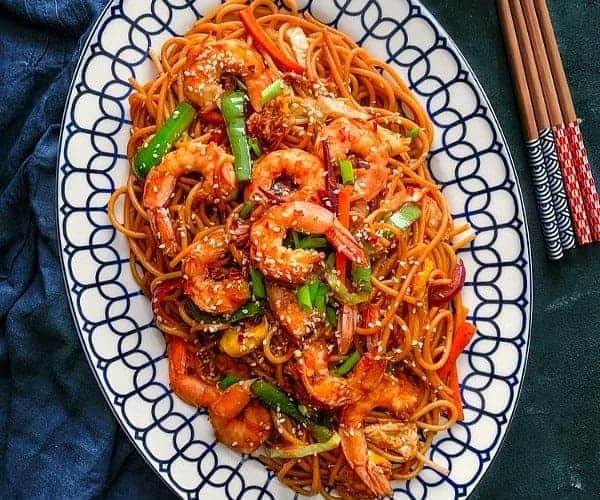 4 Replies to "Shrimp Chow Mein - Lo Mein Recipe (7 Easy Ingredients Swap)"
We love making takeout at home — thanks for the tips! 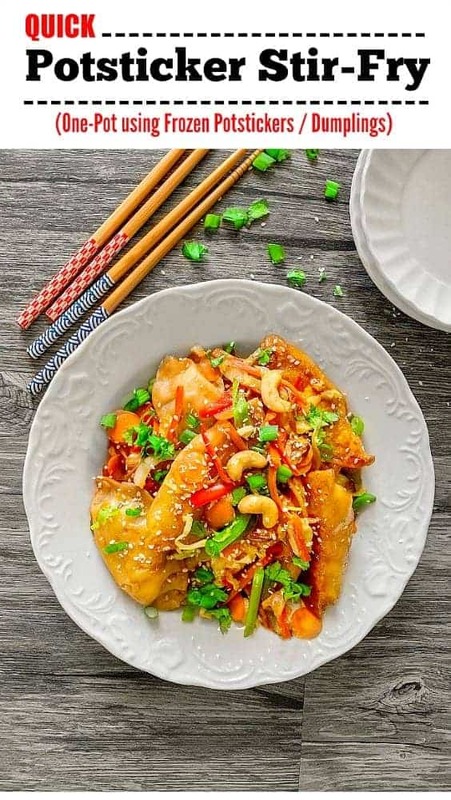 I enjoy cooking Asian at home and this is a lovely recipe.